As people walk up and down the street of Chinatown in the city of Toronto, Ontario in Canada, they stop to browse at all the different shops. Above each of the shops, colorful signs and awnings are displayed with Chinese writing explaining the name of the shop with some advertising what they sell. Thousands of people flock to Chinatown in the City of Toronto, Ontario searching for good deals and to enjoy an authentic Chinese meal. Toronto, Ontario has the largest Chinese population and throughout the region there are four different places called Chinatown in the suburbs of the city. Picture of the people outside the shops along the street in Chinatown in the City of Toronto in Ontario, Canada. ... More of the Chinese population is moving to Toronto, Ontario in Canada making the streets of Chinatown busier every year. 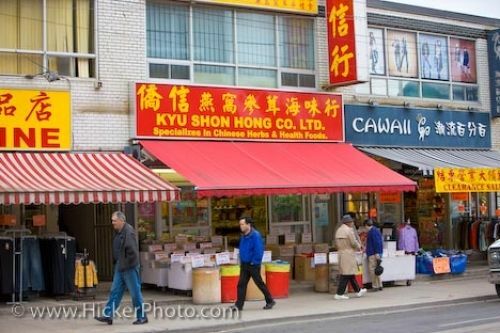 Shops lining the streets in Chinatown in the city of Toronto, Ontario, Canada.